8 2 0 1 7 W A T E R Q U A L I T Y R E P O R T QUESTIONS? 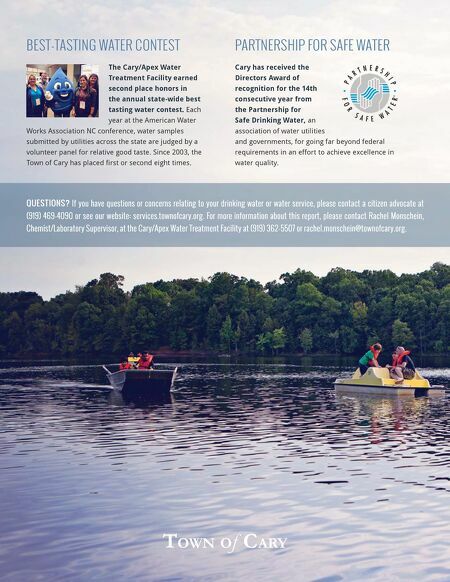 If you have questions or concerns relating to your drinking water or water service, please contact a citizen advocate at (919) 469-4090 or see our website: services.townofcary.org. For more information about this report, please contact Rachel Monschein, Chemist/Laboratory Supervisor, at the Cary/Apex Water Treatment Facility at (919) 362-5507 or rachel.monschein@townofcary.org. BEST-TASTING WATER CONTEST The Cary/Apex Water Treatment Facility earned second place honors in the annual state-wide best tasting water contest. Each year at the American Water Works Association NC conference, water samples submitted by utilities across the state are judged by a volunteer panel for relative good taste. Since 2003, the Town of Cary has placed first or second eight times. PARTNERSHIP FOR SAFE WATER Cary has received the Directors Award of recognition for the 14th consecutive year from the Partnership for Safe Drinking Water, an association of water utilities and governments, for going far beyond federal requirements in an effort to achieve excellence in water quality.